First of all we would like to heavily express that hazing is illegal. We do NOT haze pledges. Pledging is the process to become a Fraternity Brother. 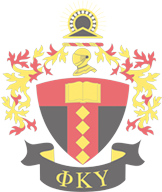 Every member of Phi Kappa Upsilon was a pledge at one point. The process is meant to teach individuals many things such as time management and commitment. Our process <MISSING>. If you believe in the values Brother Russell E. Lawrence has bestowed upon us, you are welcome to join us during rush. Rush is the vital time to shine and tell us you want to pledge for Phi Kappa Upsilon Fraternity.